AD600 (XPLOR 600 HSS TTL) vs. H600 (CL600-X) range difference? About the only online forum I check with regularly is on Flashhavoc.com. Why? Because the members there are civil and interested in helping one another unlike 99% of the other forums where most of them are trolls and ‘have to be right.’ One of the members, Randell John asked a question of the membership inquiring if anyone was experiencing misfires using the Flashpoint Portable Extension Head 600 versus the AD600. (Please note that throughout this review I use AD600 or H600 as a generic term. Currently Cheetahstand and Adorama are the only US retailers who carry the AD600/H600, but under their own brand names. And as of this writing Adorama is the only US retailer to carry a TTL version.) I had just completed an on location ballet shoot and could not recall having issues. So I called my son to see if he recalled any issues and the reality is the only time we used the H600 was during our last session at the ocean. I did recall that the strobe failed to fire, but only a few times. So I decided to conduct my own test to see if there is indeed a difference. I depend on excellent radio to strobe signal and plan to use the remote heads and Xplor/AD600 units for an upcoming studio dance shoot next week. So being confident in the gear is paramount. As you can see the Einsteins fired 100% of the time in this test with the CL-600X (Cheetahstand’s unit) having the most failures to fire. The Consecutive No Fires is the most troubling. It means that in five instances the strobe failed to fire in two consecutive shots with the most being three in a row. I should note that I do NOT believe this relates just to the Cheetahstand brand but all remote heads. As you can see when I used the Godox XTR16 USB transceiver plugged into the XPLOR unit the fire percentage went up in a material way. 81.7% without/92.9% with the XTR16. But what was more significant were NO Consecutive No Fires. As you can see the unit improved as well using the XTR16 without the remote head. Because of these results and my upcoming studio dance shoot with a long time client I decided to review my results using the remote head in the ‘real world’ for my ballerina sessions 10 days ago…. I selected the shots where the remote head did not fire and as you can see there are only two. (the ones highlighted in grey) 2 of 67 shots where the remote head did not fire or 2.98% with only the Einsteins faring better in flash percentage. And I had NOT used the XTR16 receiver during that session. I should also note that in both the little test I just did and while on location I utilized the new plastic ring which anchors the remote head onto the XPLOR 600 (AD600) securely. More secure than just the twisting lock on the attachment of the male coupling. So my initial feelings were to NOT use the XPLOR 600 at my upcoming dance session, but after reviewing my results at the beach I’ve decided to use them. The remote head and HSS are just too valuable for this upcoming shoot. And since I had good results in the real world with my ballerinas it’s worth the small risk. BUT I will bring along my trusty Einsteins just in case I need them. This is a very detailed and enlightening test Mark. I’m glad you feel happy to carry on using the remote head with your AD600B. 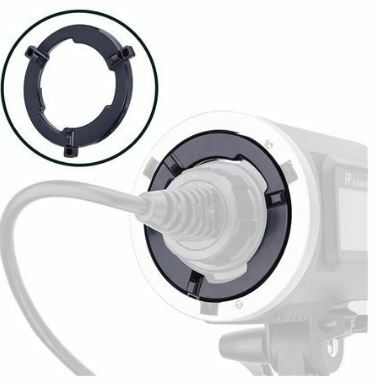 I think my problems are occurring because I don’t have the large lock ring, which fully secures the H600B plug into the face plate of the strobe pack. At the moment I’m unable to source a supplier here in the UK, but hope this will be resolved fairly shortly. One other thing that may be causing or adding to my misfiring problems is the fact that I haven’t updated my X1C Transmitters to the latest software version. I use an iMac and Mac Book Pro, and as you’ll be aware, Godox haven’t released any software to update their equipment with Apple products. Besides going out and buying a Microsoft/Windows laptop or partitioning one of my hard drives and installing Windows on one of my Mac’s, I’m going to have to loan a friends laptop for an hour or so to complete any software updates. I think Godox really need to address this issue and try and encompass Apple products into their software, especially as so many photographers use Macs. Thank you again for your response to my question on Flash Havoc and taking up your valuable time to carry out this testing. I must agree with you the Flash Havoc website is a fantastic resource for photographers, and is always one of the first sites I visit to find information on newly released products, or when I’m looking to trouble shoot a problem. You’re welcome Randell and I want to thank you for bringing your issues to my attention which is why I did further testing. Once I’ve completed the studio dance session and am able to share images I will add my findings to the test. Thanks again.